Celebrating the 800th year of the signing of Magna Carta and the 25th birthday of the WorldWideWeb, Liberation was Frequency’s focus for 2015. Data trails, predictive policing, consumer profiling; what are the ethics of a Big Data society? What are the rights of the Cybercitizen? The debates call for a new Magna Carta Digita, encoded by the people for the people. The third iteration of Frequency Festival hosted an extraordinary programme of digital art exhibitions, bespoke installations, live performance and energetic debate around the theme of Liberty, freedom and the digital revolution. The city of Lincoln is home to one of only four surviving copies of the ‘Great Charter’, which is recognised as the foundation of constitutional democracy and the source of many of the civil liberties enjoyed in free countries today. Digital artists and interactive designers from across the globe, up and down the UK, and from the local area presented new and exciting works of art exploring how the digital revolution has impacted, transformed and enhanced contemporary ideas of liberty and freedom. A key festival highlight was Seeper, the acclaimed collective which has produced innovative works for the BBC, Glastonbury Festival, Sony and Google, with the specially commissioned world premiere of The One, The Few and The Many at Lincoln Castle, on 30-31 October 2015. 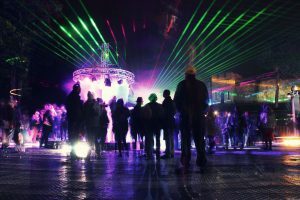 Taking place in the heart of the Castle’s medieval grounds, this monumental outdoor projection show reimagined the Magna Carta, and created a unique digital playground through a spectacular light, laser and audio display. 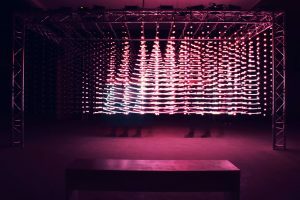 Enlightenment uses a large walkthrough array of responsive LEDs to physically surround visitors, placing them within a massive hybrid reality space. The result is a beguiling, disorienting and immersive experience that alters our perceptions of space, place and each other. 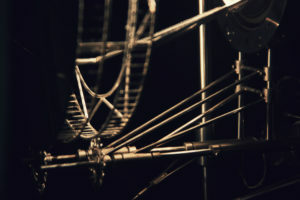 Gravity, movement and light are explored in this series of kinetic sculptures by artist and dancer Shun Ito. Metal frames and gears cast light and shadow onto the gallery space, creating myriad shapes, colours and rhythms in this work of complex yet elegant beauty. Let yourself get drawn in to the movement and experience a sense of peace and tranquillity. Watch the set up of Cosmic Birds on Vimeo. Illuminos breaks down the barrier between audience and performance, liberating both from the confines of their respective positions; a video installation set in the walls of Posterngate. 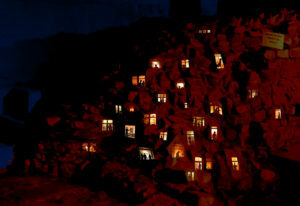 Tiny illuminated windows emerge in the stone of the Roman Wall, through which we glimpse the daily activities of the little families within. As more and more tiny lives are revealed, the piece transitions from the audience looking in at them to the little people staring out at us.